The Grizzly G9976 is the quintessential budgetmortising machine. I have had it in my shop for years now. It hascut several hundred of mortises for me. Most of time it has done soreliably. Sometimes, however, not accurately. The machine is asolid performer, but hard to set up. Benchtop mortisers are the most common option in the market. They offer all the capabilities for making mortises in short to medium lenght stock. Specialty mortisers exist for larger workpieces. A moving table allows for rapid positioning of the workpiece. Machines with a moving table have reduced cycle times compared to mortisers with a fixed table. Benchtop mortisers will cover most needs. Choose a model that has enough room under the drill bit to accomodate your needs. 4-6" is the common choice. Individual models distingish themselves by the way the workpiece is secured to the table. Since the piece needs to be moved after each plunge, it is vital that the hold-downs can be fastened and released very quickly. Some mortisers have a moving table. 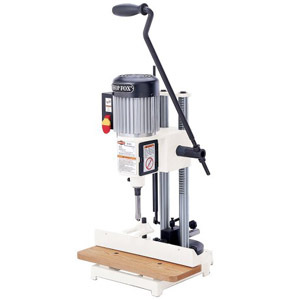 Drilling mortises on this type of machine is many times faster than on regular mortisers. If you want to work on large workpieces, it's best to look for a model with a floating drill head. These models eliminate the need to move the workpiece, which drastically improves cycle times with large workpieces. "The G9976 is a simple mortiser. It is very capable of producing square, clean mortises, but they won't get done as easily or as fast as they do on other tools."